The OldVelos Vintage Classic may have been over, but some riders weren’t done with us yet. In particular my friends alá tandem were at pains to point out that my route briefing mentioned ‘some hills’: “Hennessy, they’d call them hills in Kathmandu!” said pilot Gary Neff with nodding agreement from John Shanahan. My former bicycle shop boss John Piggott, who had slipped away from his warm bed in the early hours to be with us, had equally slipped away to return home leaving only this note: “Hennessy, I don’t know what I ever did to you to deserve this stuff but YOU’RE going to get yours one day”. Myself and my OldVelos co-organisers have chosen to take these banishments as blessings. If we didn’t give a tough course then the riders wouldn’t be able to say they did it. And heh, we had our challenges too. Let’s liken bike race organising to team time trialling, but on a cyclocross course. First there’s deciding to do it, consideration must be taken on the emotional and physical preparation, which teammates will ride, what bikes to ride, and when to peak. Then there’s the CX bit, the slippy dangers of unseen roots, the uneven camber where you lose the racing line, the bit where you have to leap off and take a running jump and the occasional slap of a low hanging branch. But at every CX race there’s a phalanx of supporters, and we had ours too. 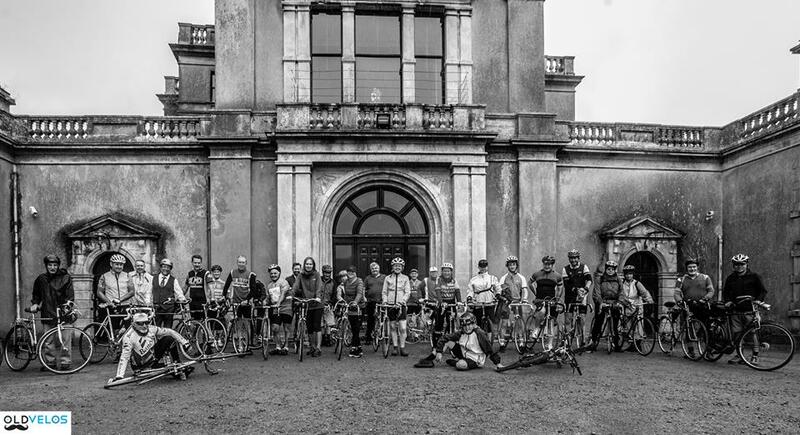 The OldVelos Vintage Classic had moved from its first home at Randle Brothers Garage in Killarney – a salute to the Nissan International Classic of old – to the new, brand spanking new, Waterford Greenway. Our early discussions with Johnny Brunnock of Waterford City and County Council and Craig Dee of Coach House Coffee showed there were going to be more to our TTT team than Alec, Peter, Paul and me. Every support was given our way. Our ‘team meetings’ were not about ‘If’ but ‘when’. As a show of strength we announced our intentions by lining out for the official launch of the Greenway in March. While we displayed old cycling shirts we really knew we needed some new names on our jerseys. This was when our team went international, high end bicycle parts manufacturer SRAM from the new world, the Dublin based Italian restaurant Ciao Bella Roma from cycling’s heartland. In OldVelos terms it was like having Greg Lemond and Fausto Coppi as your backers. We still needed a directeur sportif, he’s the guy who makes the tactical decisions. Step up one Pat Kenealy from Dungarvan CC. “Pat, I need to pick your brains on old roads…when you’re thinking about them think grass growing up the middle and 42×21”. Our DS did not disappoint “there are plenty of old roads, beautiful ones too. We do a club spin every Sunday called the Backroad Spin. I’ll put them on Strava for you”. Armed with Pat’s Strava based routes along with the OSI 75 map, Pete and I crossed and recrossed various routes, pondering links to the Greenway, potential foodstops and road signage. It was all coming together…and then, in cartography terms, it all seemed to go south. Volunteers are people who give their time for free. We were volunteers. Clocks are instruments that show time. Clocks don’t stop and neither did the foibles of life nor event administration. We all got waylaid but time marched on. Our regrouping on the verge of the race start line was more rushed that we’d have wanted. 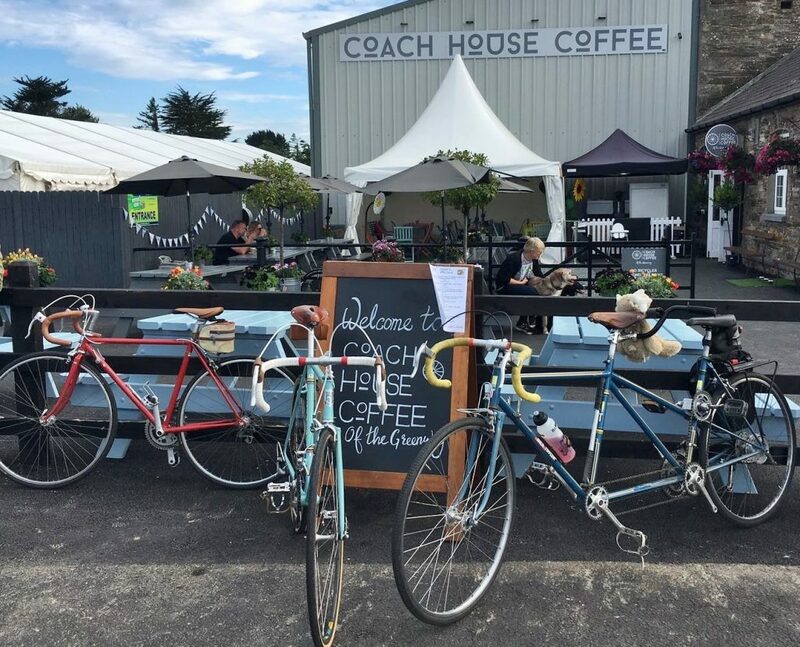 We separated out tasks and relied once again on our support: cyclists to enter the event on time; local sponsors such as Legacy Irish Cider, Flahavans, Metalman Brewing and Coach House Coffee as well as High Nelly Bikes for Concours d’Elegance prize categories. Friends of OldVelos like Ken Cummins of Midleton CTC, Jimmy Kavanagh and family from Dublin, Maria Seymour and Paul Murphy from Kilkenny, Jane Musgrave from Longford, Tom Mulqueen of Cork based OCD Bicycle Services and Paul Carroll of Waterford’s Rebike project all offered their support. Meanwhile out on route inspection we crossed a junction it would be impossible for others to follow. It was a marshalling black spot and effectively a ‘no-no’. We retraced our steps and instead of taking the highway we ventured into the unpaved grounds of Curraghmore Estate. There our luck turned once again and Lord Henry Waterford, and his team of Vanessa and Alan very kindly saw us out of a problem and our riders to safety. We were able to give Odette in the lovely courtyard coffee shop the custom of our short route riders too. Then came their request “Would we consider recreating an old cycling photo taken in front of the house in the 1900’s?” You bet yes! Meanwhile in an equally historic spot Niall at Powers the Pot campsite had agreed to host our long route foodstop. What better place to have the bananas from Castlemartyr Village Greengrocer and delicious buns from the Comeragh Stores of Rathgormick than under his thatched roof. As the weekend of the event approached had the winds that were later to blow blown there would have been sheets and sheets of paper strewn from Midleton to Dungarvan Civic Offices, to Kilmacthomas Gardaí through to Kilkenny and all the way to Cycling Ireland HQ in Dublin. Indemnification and insurance are the ‘i’s’ that help an event organiser close his soundly at night! Knowing we had motomarshalls like Frank Geary, the 3 Tom’s and Nicky from the ever helpful Waterford Greenway Bike Hire made us sleep even better. Now, however, it was time for a weather eye. 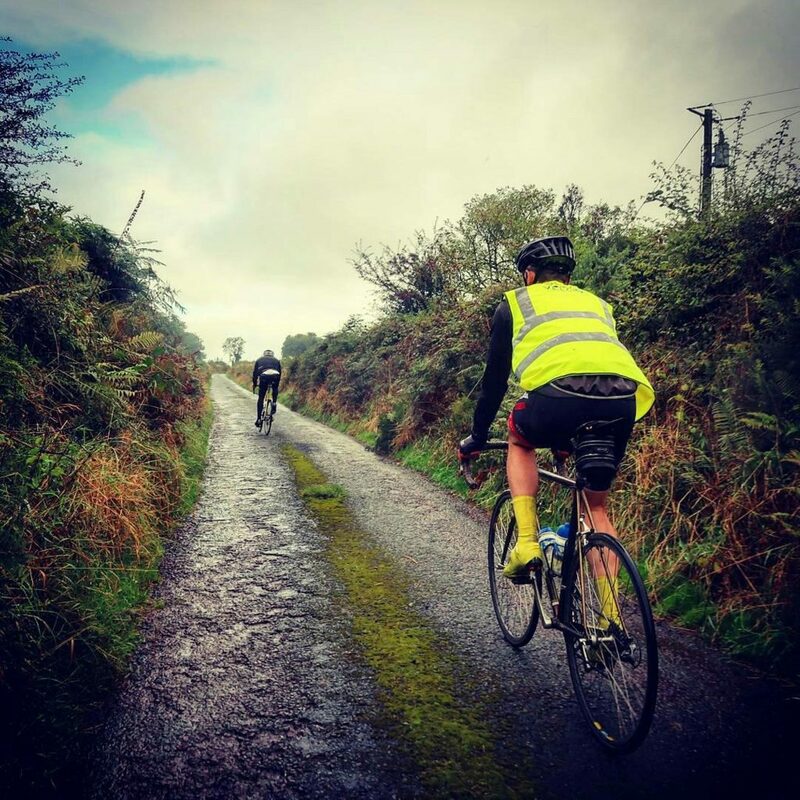 The Ironman Ireland Route Miles 31-40 approx.